President Obama has chosen former Alaska Lieutenant Governor Frances Ulmer to chair the Arctic Research Commission for the next four years. Currently, she is chancellor of the University of Alaska Anchorage. She also served as one of the seven members on the National Commission on the BP Deepwater Horizon Oil Spill. 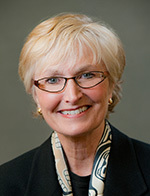 Ulmer studied political science and economics at the University of Madison, Wisconsin before going on to receive her J.D. from the university’s law school. Ulmer will bring over thirty years of experience in politics to the commission.